On a recent tour of the 13,000-square-foot Santa Rosa warehouse donated to the Red Cross to run logistics and house supplies for survivors of the deadly fires in the North Bay, regional Red Cross CEO Trevor Riggen addressed some of the most pervasive and damaging concerns swirling on social media and in the community about the agency’s disaster response. Riggen said the response to the current disaster was influenced by what the Red Cross learned from mistakes made during the 2015 Valley Fire in Lake County. A Facebook post complaining about the agency’s shunning of local volunteers and donated goods went viral. Riggen said the agency was not prepared to shelter people for two weeks, and that it did not have a system to accept help from hundreds of volunteers or the tons of donated clothes, toys, and furniture. This time, with 12,000 people who’ve signed up to volunteer since the fires ignited on Oct. 8, the Red Cross took a different approach. “Within 24 hours, we had a volunteer intake center set up in Rohnert Park. Our online system, we changed that so we could accept people to register as volunteers,” Riggen said, adding that many of those who signed up were deployed quickly to help with the disaster relief. Also different this time, the organization is now working with Goodwill in the Bay Area and Sacramento to sort through mounds of donations. What may not be useful to fire victims now will be available later. “They have given us $325,000 in vouchers that we're now sharing with our clients at our casework centers that they can go and pick out what they need when they need it,” Riggen said. At the peak of the North Bay firestorm, Riggen said the Red Cross opened 18 shelters, providing 27,000 overnight stays. Now down to four shelters, the Red Cross is transitioning to provide financial help. He says 91 percent of the donations designated for the California fires will be used on program services. Those services include $125 debit cards, medical equipment and even funeral costs depending on what families say they need. Donated funds also go towards the cost of keeping the Red Cross running: truck fuel, food, cleaning supplies and hygiene kits. Once the initial funds are distributed and the community moves into the rebuilding phase, Riggen said leftover funds designated for a specific disaster will be distributed based on follow-ups with fire victims who have the biggest need. “Who has unmet needs? Where are renters who didn’t have rental insurance? Where are homeowners that are underinsured?" he said. "If we have the resources to do long-term recovery, and that’s undetermined, we flag those cases to make sure we can come back to them. We do that in partnership with Catholic charities, St. Vincent de Paul,” Riggen said, explaining that caseworkers are supposed to follow up with fire victims to find out what they still need. 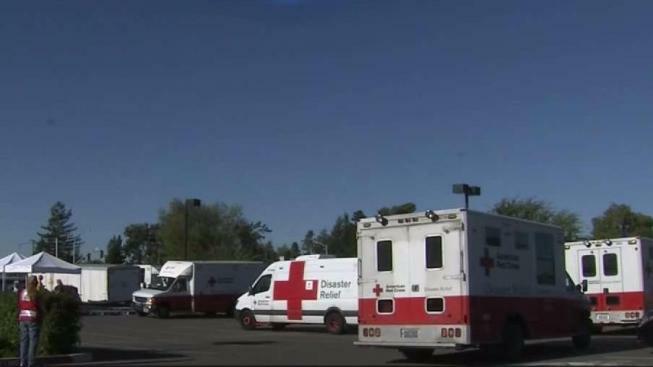 About 3,000 people signed a petition calling for the Red Cross to leave Napa, and some local residents in Sonoma County say they were given mixed instructions from Red Cross workers when they tried to volunteer at the shelters. “We brought their laundry back, their linens and Red Cross blankets, and they told us we could not bring it back because it wasn’t sterile. It was against their policy,” Bryan Patterson told NBC Bay Area. Patterson and his brother said they turned their appliance repair business into a laundry service during the crisis, working 12-16-hour days, and converting some brand new washers and dryers into a makeshift laundromat for people staying at the evacuation shelters. Patterson said Red Cross volunteers initially asked him to launder 12 bags of blankets and linens, but when he returned with the clean laundry, a different set of volunteers told him to keep it. Riggen acknowledges miscommunication can exacerbate an already tense situation following a disaster. The Red Cross is encouraging people to register now with the agency to receive the financial assistance through the debit cards and to allow caseworkers to follow up in the coming months. The Red Cross wants to make it clear this help is for everyone affected, including noncitizens. To sign up, bring a photo ID with an address or a utility bill or other document showing residency in the fire-stricken areas. Check with local counties for addresses to the Red Cross assistance centers.